Greg and Tim Hildebrandt, known as the Brothers Hildebrandt (born January 23, 1939), are American twin brothers who worked collaboratively as fantasy and science fiction artists for many years. They produced illustrations for comic books, movie posters, children's books, posters, novels, calendars, advertisements, and trading cards. Tim Hildebrandt died on June 11, 2006. Born in Detroit, Michigan, Greg and Tim Hildebrandt began painting professionally in 1959 as the Brothers Hildebrandt. The brothers both held an ambition to work as animators for Walt Disney, and although they never realized this dream, their work was heavily influenced by illustration style of Disney feature films such as Snow White, Pinnochio and Fantasia. They were also influenced by the artwork in comic books and science fiction books, notably the work of Norman Rockwell and Maxfield Parrish. The brothers are best known for their popular The Lord of the Rings calendar illustrations, illustrating comics for Marvel Comics and DC Comics, original oil paintings for a limited edition of Terry Brooks's The Sword of Shannara, and their Magic: The Gathering and Harry Potter illustrations for Wizards of the Coast. In 1977 the brothers were approached by 20th Century Fox to produce poster art for the British release of a space fantasy film, Star Wars. A promotional poster had already been produced in US by the artist Tom Jung, but Fox executives considered this poster "too dark". The Brothers Hildebrandt had established a reputation working on the Lord of the Rings calendar and a concept poster for Young Frankenstein, and Fox commissioned them to rework the image. The twins had to work to a very tight deadline, and worked together in shifts to produce a finished product in 36 hours. Their version of the poster, referred to as Style ‘B’, was distributed to be used on British cinema billboards for the UK release, and became possibly their best known work. 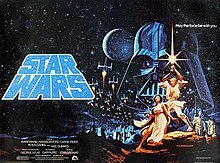 Using the same layout as Jung's Style ‘A’ poster, it depicts the character of Luke Skywalker standing in a heroic pose brandishing a shining lightsaber above his head, with Princess Leia standing below him, and a large, ghostly image of Darth Vader's helmet looming behind them. The central figures are surrounded by smaller depictions of other characters and a montage of starfighters in combat amid a sea of stars. Both Jung and the Hildebrandts had worked on their posters without reference to photographs of the actual cast, and Fox and Lucasfilm later decided that they wanted to promote the new film with a less stylised and more realistic depiction of the lead characters. Producer Gary Kurtz commissioned the film poster artist Tom Chantrell to paint a new version from film stills and publicity photos. Star Wars opened in British theatres on 28 November 1977, and the Hildebrandts' poster was displayed in UK cinemas for about two months before it was replaced by Chantrell's Style ‘C’ poster. Despite their strong associations with the works of J. R. R. Tolkien, the brothers were not given a role in the production of Ralph Bakshi's animated version of The Lord of the Rings (1978), which was a source of disappointment for them. In 1981, the Hildebrandts had another film poster commission, for the Greek mythological heroic fantasy film Clash of the Titans. Together, the brothers developed a concept for a fantasy movie Urshurak; although this never went into production, the Hildebrandts collaborated with author Jerry Nichols to publish Urshurak in the form of an illustrated fantasy novel in 1979. The lack of success with Urshurak may have contributed to their decision to work independently of each other, and in 1981 the brothers began to pursue separate careers. Greg painted cover artwork for the magazines Omni and Heavy Metal, and illustrated a number of books including Mary Stewart's Merlin Trilogy, The Wonderful Wizard of Oz, Aladdin, Robin Hood, Dracula, and The Phantom of the Opera. Tim also created cover art for books such as The Time of the Transference, and The Byworlder, as well as for Amazing Stories magazine, along with illustrated calendars based on fantasy themes such as Dungeons & Dragons. After 12 years the Brothers reunited to collaborate on work for Marvel Comics, Stan Lee, and numerous book projects. Greg Hildebrandt, Jr. also made major contributions to the production of a book entitled Greg & Tim Hildebrandt: The Tolkien Years, which gave an overview of the Tolkien genre artworks produced by Greg and Tim in the 1970s. Individually, Greg is also known for his contributions to the art for the Trans-Siberian Orchestra's albums and concert merchandise. He also provided the cover art for Black Sabbath's Mob Rules album. He started his American Beauties pinup art in 1999. In 2019, it was announced that Greg would provide cover art for a new series of Star Trek comics, Star Trek: Year Five, from IDW Publishing. This was the first time that Greg had worked on the Star Trek franchise. Tim Hildebrandt illustrated children's books, two Dungeons & Dragons calendars, and the poster for the film The Secret of NIMH; his art was also used in advertising by AT&T and Levi's. Tim was also Associate Producer of the horror-themed science fiction film, The Deadly Spawn. Tim Hildebrandt died on June 11, 2006 at the age of 67 due to complications of diabetes. Tim won the 1992 World Fantasy Award for Best Artist. In 2010 Greg Hildebrandt received the Chesley Award for Lifetime Artistic Achievement from the Association of Science Fiction and Fantasy Artists. Together, the brothers were awarded the Gold Medal by the Society of Illustrators. ^ a b "United States Social Security Death Index", index, FamilySearch (https://familysearch.org/pal:/MM9.1.1/JGXM-66D), Timothy M Hildebrandt, June 11, 2006. Citing U.S. Social Security Administration, Death Master File, database (Alexandria, Virginia: National Technical Information Service, ongoing). Retrieved 2013-02-12. ^ Lentz III, Harris M. (2007). Obituaries in the Performing Arts, 2006: Film, Television, Radio, Theatre, Dance, Music, Cartoons and Pop Culture. McFarland. pp. 161–2. ISBN 9780786452118. Retrieved 6 August 2018. ^ a b Robb, Brian J.; Simpson, Paul (2013). Middle-earth Envisioned: The Hobbit and The Lord of the Rings: On Screen, On Stage, and Beyond. Race Point Publishing. p. 214. ISBN 9781937994273. Retrieved 1 August 2017. ^ a b "The Art of The Brothers Hildebrandt". Archived from the original on April 29, 2011. ^ Boucher, Geoff (19 June 2010). "The classic 'Star Wars' poster and The Force of history". Hero Complex - Los Angeles Times. Archived from the original on 31 July 2017. Retrieved 31 July 2017. ^ Dass, William (14 December 2016). "The History of Star Wars Posters". Film School Rejects. Retrieved 30 July 2017. ^ "A short history of the first British Star Wars posters". www.sci-fimovieposters.co.uk. Retrieved 30 July 2017. ^ a b "Authors : Hildebrandt, The Brothers : SFE : Science Fiction Encyclopedia". The Encyclopedia of Science Fiction. Archived from the original on 1 August 2017. Retrieved 1 August 2017. ^ "Brothers Hildebrandt Biography". BrothersHildebrandt.com. Archived from the original on 31 July 2017. Retrieved 31 July 2017. ^ "Mob Rules creative credits at Black Sabbath website". ^ McMillan, Graeme. "'Star Trek: Year Five' to Explore Hidden Chapter of Enterprise History". Hollywood Reporter. Archived from the original on 22 January 2019. Retrieved 22 January 2019. ^ a b "Tim Hildebrandt; illustrator famed for 'Star Wars', 'Rings'". San Diego Union-Tribune. Knight Ridder News Service. June 25, 2006. Retrieved 2010-08-21. ^ "The Locus Index to SF Awards: 1992 World Fantasy Awards". Locus. Archived from the original on 2013-09-20. Retrieved 2013-09-20. ^ "2010 Chesley Award Winners". Association of Science Fiction and Fantasy Artists. Archived from the original on 2012-01-11. Retrieved 2012-01-07. "Greg Hildebrandt at Pen & Paper role-playing game database". Archived from the original on February 15, 2005. "Tim Hildebrandt at Pen & Paper". Archived from the original on 2005-02-15. Retrieved 2008-12-12. This page was last edited on 21 March 2019, at 02:38 (UTC).